There is an empty lot on Sixth Avenue, bounded by Grand and Canal that has been temporarily transformed in a very smart way. The Lower Manhattan Cultural Council made a deal with the owners to borrow the space while it lies vacant. They call it LentSpace and in it they put trees incubating for placement on city streets, umbrellas, tables, chairs, wooden benches, a little stage and most recently they have invited a series of ever changing food trucks to inhabit lunch time. We went today because the Hudson Sq. Food Truck twitter feed told us that Taim Mobile would be there. The line was long, though it moved quickly, it was still a good 25 minutes from start to eat. 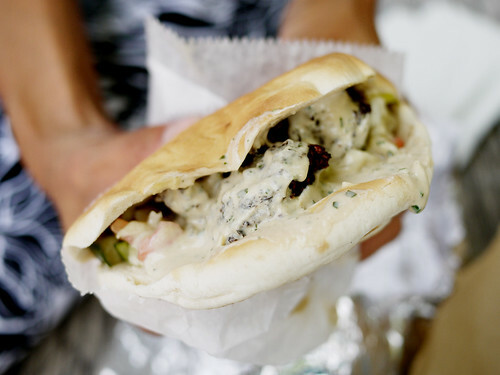 No matter, the falafel sandwich was bursting with flavor and surprisingly filling for a $5 meal.